WHEN TO TREAT FOR GRUBS? HAVE PATIENCE; GRUB CONTROL TAKES TIME! Americans like having green lawns and lush landscaping around their homes. This design usually incorporates some type of grass like Bermuda, Fescue, Bent grass or Zoysia just to name a few. These environments need food and water to keep them healthy and looking good. These same requirements are what lure many types of pests in and around the home. Though most may only nest or traverse through the grass, some actually eat grass. Surface feeders like locusts, grasshoppers and katydids are easy to see so activity can be quickly identified and properly handled. However, pests which reside and live under the grass pose a whole other problem. One such pest actually eats the roots of grass and the unwary homeowner won’t know it is active or present until their grass starts to die! This pest is quite common and can appear anywhere in the United States. This pest is the common GRUB !!! Grubs are the larval stage of beetles. There are many types of grubs but the ones which live in the dirt under grass are most likely Japanese Beetle, June Beetle, May Beetle, Black Turfgrass, Asiatic Garden or some other regional beetle which lays eggs whose larva feed on plants. Most people know what grubs look like. They usually have an off white, tan or even brown head, tend to be curled in a “C” position all the time, have lots of legs and a segmented body which is quite white. Grubs can vary greatly in size which is not only dependent on species. Clearly the food supply has a lot to do with just how big or small any one grub might grow. Other variables like temperature, humidity, water, local nutrients and soil type will influence their size and development. In most cases, eggs laid by adults will hatch in the spring or summer and the feeding grub larvae will grow up during the warm months of the year. By late summer and through the fall, they’ll be close to the soils surface where they’ll be chomping away at grass roots and other plants. This activity will cause plant damage and in some cases, attract digging predators like RACCOON or ARMADILLO. Grubs live just under grass, usually 6 inches to a few feet down, all of which depends on their species, food supplies and the time of year. Since so many insects generate a grub like young which can live in turf, the purpose of this article is not to inform you of any one specific species. The author will, however, explain all you need to know about grubs in general and then offer control methods which are designed to control whatever type of grub you may have active on your property. 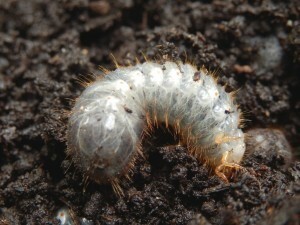 Grubs usually go unnoticed until the results of their feeding is observed. Such results will include dead grass, plants and flowers. It is quite common to find them still feeding even as you are removing the dead plant, turf or flower!! Such “pockets” of grubs should be more then just an alarm alerting you to what is happening. Don’t ignore it. Grub damage is by far the most common type of damage sustained in turf grass throughout the United States. If you want to make sure you don’t fall victim to a local infestation, get a pair of STRESS DETECTION GLASSES. These unique eye glasses allow you to “see” grass and other plants which are stressed out due to fungus, drought and parasites like grubs. Early detection will give you the upper hand when combating this pest. In other words, early detection allows for early treatments. In addition to grubs killing off plants, shrubs and grass, their presence tends to attract all kinds of animals. Moles, armadillo, badgers, birds, mice, rats, voles, shrews, gophers, groundhogs, opossum, raccoon, prairie dogs, and skunk are just some of the animals which will readily tear up and pull apart lawns in an effort to find grubs. They love grubs and lawns which have active grub populations will undoubtedly start to experience animal digging and damage. Grub infestations can also lead to other insect problems. There are many types of wasps which actually feed on grubs. These parasitic wasps thrive in yards where grubs are present and will come to feed and nest when large grub populations are active. For the longest time, grub control has always been addressed by using granules applied to the turf at a “key” time of the year. It has always been preached that grubs are active in “certain months” and that it is only during these times of the year that chemical treatments will have any positive impact. Well, this approach has lead to somewhat inconsistent results. The inconsistencies stem from many facts. Here are some of the problems related to a “timed” application approach to grub control. 1) Timed applications rely on a premise that there is only one time of the year that a target population is active. Though this could be true for any one species, it is not likely that anyone can tell when this time might occur for the species active in your yard. In other words, what could be the “right” time in one yard may not be “right” for a neighbor. In fact, their time could be a month or more later or earlier. 2) There are far too many species of insects laying eggs which develop into damaging grubs to use this approach. Each species has a different time of the year which is the “right” time to treat and without knowing just which species you are treating for, trying to time the application is not practical. And since it is cost prohibitive to learn just which species you might have, even if you did know, it would only narrow the time frame down to a few months due to the problem of timing stated above in item #1. 3) The development of grubs varies tremendously from insect to insect. There are many grubs which are only active for one year but most are active for 2-3 years! In other words, an application made one year due to grub damage might have an immediate impact on the population that is currently feeding. However, all the eggs which haven’t hatched nor the ones which have already moved deeper because they have already fed will be impacted. This problem – the problem associated with the fact that several species are active for short intervals of time and that not all stages of any population will be vulnerable to a treatment at the same time – means more than any other reason that you must treat several times in any one year and that you will have to do so for several years running!!! Problem #3 is probably the biggest mistake most people fall victim to regarding a timed application. They follow the advise of some local nursery or garden center which has recommended “one application” made at a precise time will get the problem under control. Nothing further from the truth could be true!!! Such an approach does not take into account all the eggs which have not hatched, the part of the local population which has already fed and moved deeper into the soil which will effectively shield them from any treatment as well as the fact that it not likely that any one time is ideal! Remember, grubs which develop over a period of a few years will become active at different times of the year based more on their stage of their growth. In other words, the late spring might be right for 1 year old grubs which takes 3 years to mature but in their second year, they might be more active in the middle summer months. This will vary from species to species as well so there is clearly no way you can plan for the “right” application season let alone moment! So then when is the best time to treat for grubs? NOW!! The only exception to this rule would be if you reside somewhere cold and the ground you want to treat is either frozen or covered in snow. In these regions, it will probably be tough to treat throughout the year but if you have a mild winter, be sure to get down a treatment if possible. Remember, in cold regions treatments will last way longer since the chemical won’t be subject to the normal sun and rain which wear them down during the summer months. But in many regions treating once in the spring, once mid summer and once in the fall will be required to successfully break the grub cycle once it’s established and if you follow this regime, you should see positive results in the spring of the year following your initial treatment. There are two types of grub treatment schedules that can be used for any lawn. The first is well suited for light infestations or if you’re treating to make sure you don’t get any. 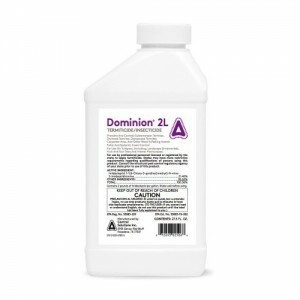 GRUB FREE ZONE is a long lasting granule and when combined with DOMINION 2L, on application made in the spring will protect your yard for the whole year. Grub Free comes in a 10 lb bag and one bag will cover up to 7,000 sq/ft. Apply this in early spring, no later than the end of April. Apply them with a good GRANULE SPREADER and be sure to treat all mulch areas, flower beds, etc. Next, spray over the top with Dominion. This concentrate goes a long way and will require a lot of water to get it down into the soil. Use .5 oz per 1,000 sq/ft so for a 5,000 sq/ft yard, you’ll need 2.5 oz of concentrate mixed with 5 gallons of water. The best way to apply the Dominion is with a good HOSE END SPRAYER. 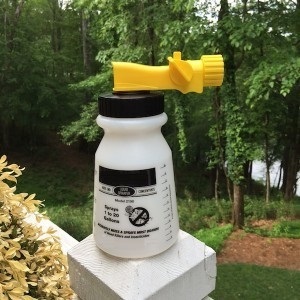 This is the kind of sprayer that attaches to your garden hose and uses the water pressure in the home to spray the turf so its usually very efficient. Setting it up to spray is easy to. In this example, lets say you wanted to treat 5,000 sq/ft. First you would add the 2.5 oz of Dominion to the sprayer. Next, you’d fill it with water up to the 5 gallon line which is about 1/4 of the way full. After that, you’d hook it to your hose and spray. The second type of treatment schedule you should employ is if you have a lot of grub activity. When grubs are actively present, you need a fast acting, quick killing active for fast results. The next two products will work in days and since they taste really bad, will help repel and chase off digging predators too. Like the treatments above, you’ll first start by applying DEMAND GRANULES. Use 3 lbs per 1,000 sq/ft. This product comes packed in 25 lb bags and will treat up to 8,000 sq/ft using a granule spreader like the one listed above. After applying the granules, spray over the top with either CYONARA RTS or CYONARA CONCENTRATE. These use the same active as the granules which is fast acting and will work acutely on active grubs. And like the granules, they will repel insect pests from the treatment as well as digging predators since they don’t taste good. For small yards, the RTS should suffice. It can treat up to 16,000 sq/ft and should be applied once every 2 weeks for at least 2 treatments. If you have a large lot to treat, get the concentrate. Using the HOSE END SPRAYER listed above, you’ll add 1 oz of Cyonara and then fill the sprayer to the 5 gallon line. This amount will treat 5,000 sq/ft and should be done every two weeks for at least two treatments to kill off all current grub activity. When treating a yard which has activity, it is always best to treat the whole yard including flower beds and mulch areas. Remember, just because you haven’t seen damaged grass or plants in some areas it does not mean that grubs are not present. Since you are treating a pest infestation for which a good visible inspection is just about impossible to perform, it is always best to treat as much of the area as possible. This insures you won’t miss a vital “grub pocket” which could lead to a lot more damage a month or two later. Treat at least once a month for two applications of liquid to insure you get good coverage. OIf preferred, you can opt to treat with a product approved for “organic gardening. GRUB KILLER RTS. is effective on grubs and like the Cyonara RTS, easy to apply. Each quart will cover about 4,000 sq/ft and you should treat at least 3 times spaced 7 days apart. 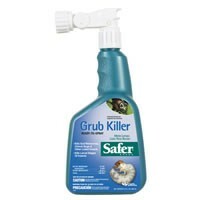 Grub Killer won’t provide much of a residual so expect to treat every spring, summer and fall to keep grubs away for good unless you apply the Grub Free Granules listed above once they’re eradicated. Using the products listed above, you can obtain grub control. But understand it will take one season to knock them out and in most cases, the benefit won’t be realized to the next spring. But remember it took years to kill off your turf so don’t expect it to come back within a few weeks. If its early fall when you first start treating, there just won’t be enough time to see the positive results but you will see the reward next year. Grubs are the single most common turf problem found throughout the United States. There are many reasons why they like to feed on our grass, plants and shrubs and though they might be out of sight, the damage they do will soon be quite evident. If you have had a bad experience with grubs and want to treat your turf so you don’t get them again, apply Grub Free Granules every spring and you’ll never get them. 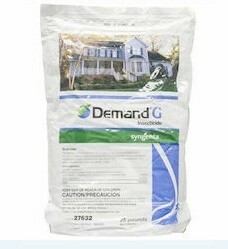 But once you have an active population of grubs, go with Demand Granules and Cyonara for fast control. These actives will work quickly and knock out all activity and since they will also repel insect pests and digging predators, you can get started on the right track to grub elimination right away. Where can I find and purchase the chemicals refered in your article? I am located in Shelby County Alabama. @R. P.: It’s not likely you’ll find our products locally because most of what we sell has limited distributorship by design. Remember, these are what the professionals use and not “over the counter” ready to spray products. Keep in mind we ship most orders the same day or next day latest. When you take this into consideration, most people find it’s much easier to order on line instead of driving around town hoping someone has what they need. So see if you can find it and if not, I invite you to order direct from us. You’ll have your order in a couple of days and between our fast support and technical knowhow, I’m sure we’ll be able to help you solve your pest control problems. I have had an active grub problem for some time as evidenced by moles. 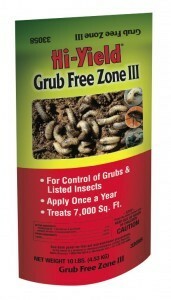 I’ve used your products successfully for other pests in the past and intend to order for treatment of grubs. I live in New Hampshire where there is snow on the ground and the ground is frozen — although not as deeply as most years. My question is when to apply the granules and liquid. Thanks. @N. C.: Last fall would have been ideal. Maybe Late October or November. Treatments done as the ground freezes will serve you in two ways. If the winter is mild, you’ll have something in place should the grubs come up to feed. This happens when it’s mild like most of the country has seen this past winter. On the other hand, if it gets cold like normal (as you describe is the case right now), the treatment will stay in place and last the entire winter without much if any degradation. This means as spring appears, you’d have a treatment in place to protect you as soon as the grubs got active. Unfortunately this window has passed so here’s what you do. Get the required amount of product needed for the turf you want to treat. And as soon as you see the ground and then a “soft enough” surface so that a treatment will absorb, apply both the granules and liquid listed above. You’ll need a good 1-2 inches of soft top soil for the treatment to hold. If you do this properly, the treatment will soak in plenty so that even if it did freeze, the chemical wouldn’t go away but instead be there for the when the complete thaw was to happen. Conversely, if it turned out that the thaw was going to run it’s course with no further freezing, you’ll have in place the treatment needed because at one point the grubs will get moving and feeding. And it’s at that point you really need something in place ready to get them. In summary, you need to get what will be needed and be prepared to treat. Having lived in the Northeast (New York and Vermont), I know the thaw can take till April. But in many cases it can come earlier and based on the mild winter we’ve had, my instinct tells me by late February or mid March is when the treatment will have to be done but one can never be 100% sure. Just be ready and when the ground is soft enough, treat and treat again in 2 months and you should really knock them out this year! I have a large fern growing in the house and have noticed grubs or little white worms in it. This has only been noticed in the last couple of weeks but by the look of the soil they have been there for a while. My plant is not near any other plants. This is an easy one. Potted plants will many times get insect infestations and since they’re mostly kept in the home, it can happen anytime of year. But trying to determine just what species of insect it is can be tough since many larval grub stages look the same. The good news is this stage is very easy to treat and with one drench, you should be able to knock them right out and in turn, save the fern. For this type of treatment, I’d recommend the organic Multipurpose Insect Killer. It’s approved for organic gardening which means it’s okay for use on vegetables and fruit bearing plants. But even though it’s very safe, it’s quite effective on a wide range of pests so it will easily handle these guys I’m sure. To treat, simply add some to your watering can. And if you have other potted plants, I recommend treating them all with this solution. The mixture rate is 2.5 oz per 1/2 gallon of water (5 oz per gallon of water). Once mixed up, water your plants as normal. In this case the plants will be getting the water they need along with a mild dose of the Multipurpose Insect Killer that will take care of these grubs on contact. Give the soil a good inspection every week for the next 2-3 weeks to be sure they don’t come back but in my experience, one treatment should do it. Good luck! I have a white grub infestation in my lawn. All my sod is coming up when I rake. What do I do? First, check the PH using a PH Soil Probe. Only when you know the PH is right should you begin to treat. Now if the PH is 6.5 or higher, remove the sod you suspect is dead along with all other thatch and loose organic matter. Next, apply some Complete Lawn Granules over the entire yard making sure you apply enough as the label reads. If you cannot figure out how much you need, give us a call and we can assist in the calculation. Next, spray the Cyonara RTS over the top. The Cyonara should kill live grubs and the granules will provide 30-45 days of residual action so they should be used together, one after the other. And for the rest of the year as well because it would be wise to keep treating every 30-45 using the same materials. Now if you follow this routine, next year at this time there will be no grubs in the yard and your grass will be fine. As for replacing the damaged sod; you can do so 2 weeks after the first treatment and then do not treat for at least another 2 weeks after you lay the sod. And do not replace the sod if the PH isn’t right! How soon after applying the chemicals listed above for grubs can children and/or dog play freely and safely on the lawn? Generally once the treatments dry. In this case within an hour; 2-3 hours if you prefer to be extra safe. More information can be found in our Safety Videos which cover all you need to know for safe handling, application and storage of our products. Big question..I inherited a poorly kept Bermuda lawn in Oct when I moved to Fort Worth, Tx. Grass was almost non existent this spring. I do have a lot of Grubs and had the back lawn tilled yesterday. Robins and other small birds are in a feeding frenzy today!! I’m about to re seed and re sod with Bermuda..should I treat the tilled dirt first before the reseeding and sodding with the Merit granules and the spray on Permethrin THEN do the seeding and sod laying ? Your web site is incredible and so chocked full of info..far superior to any other I’ve run across in my quest for info on those nasty grub worms! Here’s what you need to do. First and foremost, get a good PH reading of your soil. Too many times we find people in similar situations fail to test their PH which leads to weak grass. And though your turf won’t show it immediately, if you plant on poor soil, bugs, weeds and fungus will thrive making it that much harder for your newly sodded Bermuda to live a full life. Assuming it takes a day or two before you get your PH measured, the local birds will have assuredly taken most of the grubs. But don’t let that stop you from treating. What you need to do prior to planting the new sod is spray a good liquid treatment using Permethrin SFR. With the soil being open, aerated and vulnerable, the liquid spray is all you’ll need for now. And a Hose End sprayer will apply it nicely. Now after the turf is planted and established (about 2 months from the day it’s laid in place), treat over the top with some Merit Granules or Bifen. Do this twice a year if you choose the Merit; 3 times a year if you go with the Bifen. Personally I like the Bifen (even though I have to treat more frequently) because it handles so many other pests. Good luck! I will get a Ph tester and do the soil testing first. Do I need to water the dirt first before applying the Permethrin or will it penetrate sufficiently on the dry dirt? How safe is it for the birds feeding in the yard after I use Permethrin? Thank you SOO much for your ultra fast response !! Wow I’m impressed ! Scotts told me it would be 4-5 days to respond..so much for them ! The SFR version is just more concentrated form (so it’s more cost effective for large scale jobs like this) but by the time you mix it up, the rate is the same so there is no inherent risk to birds or other animals in the area following your treatment should they feed off anything treated or walk over the treated soil. As for watering the soil first; definitely do so. This will enable the product to seep in better. 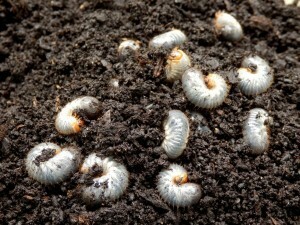 Can I use grub killer in my garden to kill the grubs in the soil and is it harmful to my garden plants? I’m not able to answer your question directly without knowing a few more details. First, is the “garden” just a flower garden or are you growing something edible like fruit, herbs or vegetables? This is critical. And if you’re growing something you plan on harvesting, you’ll be limited in what you can apply. That being said, most all of the products we have listed above can be used in any standard flower garden. But if you’re wanting to treat a vegetable garden, you should only apply something safe around edible crops like the organic Grub Killer spray. With the major drought in Indy, is it a waste to have this applied now or even this year? Grubs will get active and dormant with the weather. So when it’s dry, all it takes is someone watering and they’ll get active where it’s moist. So following a drought, one good rain will get them going. And during the winter, one or two warm days and they’ll rise and start feeding. Additionally, when it’s dry, the treatment of Merit Granules will last that much longer. So if you treat and it’s dry for a month or two, the treatment will carry through this time with little loss of it’s potency because the weather was stable. So even though the grubs may not have been too active, the treatment will remain in place and be ready for any time they do get active. For this reason treating at least twice a year no matter what is the best way to go to insure long term control. stop this and be able to save my lawn? Also, in May I put grub control down and weed and feed also. Lawn looked great till this problem started end of June. Thanks John. First, I suggest you make sure the soil PH is fine. Do 10-25 spot checks throughout your grass using a good PH Meter. Once you know the PH is a good 6.5 or higher, proceed with some granules. Since it’s August, I suggest going with the Cyfluthrin Granules. It’s long lasting and will last 1-2 months. After applying the required amount, spray over the top with Cyonara RTS for a quick kill. This “one-two” punch will kill off what’s active now and help prevent future activity. Just remember to treat at least every 2 months; once a month when the problem is active. Now once you’ve got the PH in check and have done the granules/liquid treatment, you can add weed and feed no sooner than 2 weeks after the initial treatment. I am worried about my dogs. If a spray is applied, when is it safe to let them go on the grass? If a granular application is applied, when is it safe to let my pets go on the grass? I have recently noticed grubs in the house in random places with 5 or 6 to a grouping, they are all dead though. We have one fern in the house but the grubs were several feet away from the fern. What could they be from? This is what I would call an “open ended” answer. Since most any insect starts from what we call a “grub”, there is no way I can help narrow the options logically. Now if we could see a picture, that might help. But lawn grubs (what the article above is about) don’t typically get into homes so I think we can rule this type of grub out and not what you’re finding. Now what you probably have is maybe carpet beetles, clothing moths, cigarette beetles, meal moths, khapra beetles or some other dermestid. I suggest you review some of our online articles about these pests and then give us a call if need further guidance. For now I don’t have enough information to suggest any kind of treatment routine but if we can talk on the phone, we might be able to get more information enabling us to help make some logical decisions about how to best proceed. My problem is with armadillos. They are making my lawn a mess. I have set traps, moved them around from place to place, even watered trying to bait them but they go everywhere but in the traps. What do we do? We live in Central Oklahoma. A couple of things. First, review our Armadillo control. It will provide a few tips on how to trap these guys as they can be tricky. In the article you’ll learn about using a grub based lure and no doubt this will help. Next, try setting the traps using the “funneling” method. It can really help. I have a serious recurring grub problem that I have not had success addressing. I have just had my lawn turned over in prep to seed for the fall. Grubs have totally destroyed the lawn. I want to aggressively treat for the grubs first. How long after treatment (and I need an aggressive liquid spray) is it safe to reseed my lawn without risk of damage to the freshly seeded lawn? Now once you know the PH is okay, go ahead and apply Complete Lawn Granules followed by liquid treatments of Cyonara. If you apply the granules now and spray with Cyonara, you’ll be able to reseed within one week of the application. And after you seed, don’t spray again for at least 2 weeks and you won’t risk hurting the new grass. Lastly, you will need to spray at least twice after the seed is applied to insure you get as many grubs as you can before winter sets in. Now as winter sets in, make sure you still have granules applied since grubs will be active all winter. Stick to this routine and you should be able to dramatically reduce them by next spring. And if this happens, you’ll be able to forego the constant spraying and move to the Merit Granules which last longer so you don’t have to keep applying as much. Thanks for your article on grub control. I have learned a lot from it. Currently my lawn is under attack by moles. I also found grub activity all over. What should I treat? The moles first or the grubs? And when do I start? Thank you very much. If you review our Mole Control and Grub Control articles, you’ll see that we discuss both in each article. In other words, if you get grubs, there is a good chance you’ll get moles. And if you get moles, they probably came around because you have grubs! That being said, the best approach here is to deal with the grubs directly first. In most cases, once you treat the grubs and the treatment takes effect, the moles will move away as their food supply diminishes. And as explained above, grubs typically come to the surface during the winter months so in fact now is a great time to treat. Start by applying some Bifen Granules or Merit Granules. Next, spray over the top with some Cyonara RTS or Cyonara Concentrate. For smaller yards (5,000 sq/ft or less), the RTS will be enough. But if you have a large yard, getting the concentrate will prove more cost effective over time. You will need to do a little more prep work before spraying when using the concentrate and you’ll need a hose end sprayer to do the job as well. Once you treat, the grubs will begin to die and if you treat enough, you’ll eventually kill off the active grubs inside of a month. During this time the moles will be forced to forage elsewhere for food and in most cases, just disappear. Now if for some reason you’re still finding mole activity after two treatments (treat 1-2 per month initially for the first 2 months), review our Mole Control article for ways to treat them. I have free range chickens. Will treating for grubs with granules or sprays hurt them? Chickens and other birds can be sensitive to many of the products commonly used for grubs. This is especially true with granules. Remember, chickens spend most of their time feeding and pecking at anything on the ground. Given this pattern of behavior, there is no doubt some of whatever you apply will be ingested at some point. For this reason, it’s important to use something which poses no hazard to them in case they do eat it. And the only product that will be safe enough for use in this scenario is the Essentria Granules listed above. Made with food grade actives that pose no hazard to people or pets, Essentria is safe enough for sensitive areas yet effective enough to control even grubs. Apply every 2 months throughout the year and spray over the top with Organic Grub Killer at the same time. This 1-2 step process will yield positive results and not present any hazard to your chickens. I live in New Hampshire. What is the timing for spring application? Do (can) you apply both products on the same day? If you review our “when to treat” section of our article above, you’ll learn that ideally you would have treated last fall, just before winter set in. This treatment would have held up most if not all of the winter had it been done which would have helped your cause immensely. But since you missed that treatment window, you’ll need to wait. So for cold regions like New Hampshire; waiting till the ground thaws and the snow is gone will be the next best time to treat. My guess is (based on what the ground hog predicted for this year!) you’ll be able to treat sometime in March; no later than April. And once you get going this spring, be sure to stay the course all year long to knock this problem out.